I thought that I was done with Halloween. It's not one of my favorite holidays and I was happy it was over. But noooooooo, it came back with Laura Harms' challenge this week. Thanks Laura. Reliving Halloween, I decided to go with our snowy weekend before the dreaded day. Lots of snow in the northeast, although we only got about 6" here. I even got dressed up a little for a Halloween ski at Viking Touring Center on Sunday. That's me in the front. 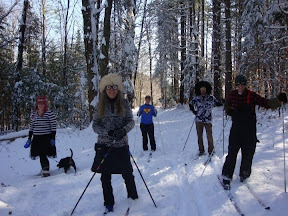 The weather, skiing, and company was great. Good to get out on skis! Now, on to the ZIA of Hallow's Eve. 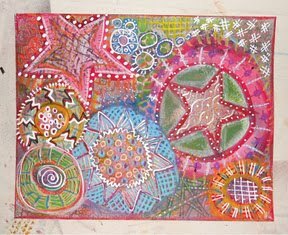 Very creative tangling. I like your snowman with the pumpkin head. I am not a big Halloween fan either! Brillaint idea! 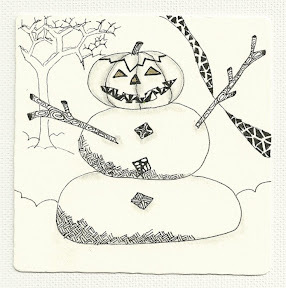 Snow plus Halloween equal scary snowman! Bravo!